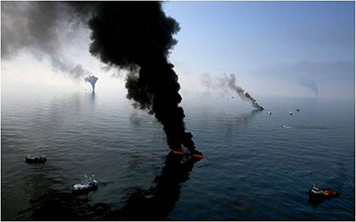 In situ burning, or ISB, is a technique sometimes used by people responding to an oil spill. In situ burning involves the controlled burning of oil that has spilled from a vessel or a facility, at the location of the spill. When conducted properly, in situ burning significantly reduces the amount of oil on the water and minimizes the adverse effect of the oil on the environment. SMART: SMART (Special Monitoring of Applied Response Technologies) is a monitoring protocol for both in situ burning operations and dispersant application. The ISB module of SMART provides guidelines for monitoring the smoke plume from ISB operations. Residues from In Situ Burning of Oil on Water: Read a survey of current knowledge about the behavior and effects of ISB residues. In Situ Burning Emissions Comparisons: The particulates released into the atmosphere by in situ burning are a concern to many people. Compare in situ burning emission rates and rates of emission from other kinds of sources. Guidance on Burning Spilled Oil In Situ [PDF, 12.7 KB]: A 1995 position paper from the National Response Team on the recommended limits for short-term human exposure to particulates measuring less than 10 microns (PM-10) while spilled oil is burned in situ. Open-water Response Strategies: In Situ Burning [PDF, 36.4 KB]: Why conduct in situ burning? How is it done? What about the emissions that it produces? Where has in situ burning been conducted? What factors might prevent its use? RRT VI Guidelines for Inshore/Nearshore In Situ Burn [PDF, 17.4 KB]: Advantages and disadvantages of in situ burning of oiled wetlands, safety and operational guidelines, and a checklist for in situ coastal wetland burns. In Situ Burn Unified Command Decision Verification Checklist [PDF, 17.1 KB]: This checklist, created in 1997 with input from the Region II Regional Response Team, summarizes important information the Unified Command should consider when planning oil spill in situ burning in marine waters of Region II. Health and Safety Aspects of In Situ Burning of Oil [PDF, 31.1 KB]: Presents health and safety considerations for response personnel, the general public, and the environment. Sample Site Safety Plan for Marine In Situ Burn Operations [PDF, 65.3 KB]: A draft sample site safety plan that includes elements unique to ISB. The sample is not a standard but rather a suggested starting point.